Good nutrition is essential for your child's developing teeth and gums as well as the rest of their body. You do what you can to provide them not just nutritious meals but also healthy snacks for other times of the day. But once they begin school, you can't watch out for them all the time. They could be away several hours where they might be tempted to make unhealthy snack choices. What can you do to lessen their chances of unhealthy snacking at school? Engage with the school and their snack offerings. A set of U.S. Department of Agriculture regulatory guidelines called Smart Snacks in Schools sets minimum nutritional standards for snacks offered on school grounds. These guidelines promote whole grains, fruits, vegetables and low-fat dairy products and limit calories, fat, salt and, of particular importance to dental health, sugar. The guidelines, though, are only a minimum, so join with other parents to encourage your school to exceed those snack nutrition minimums whenever possible. Educate your child about nutrition. 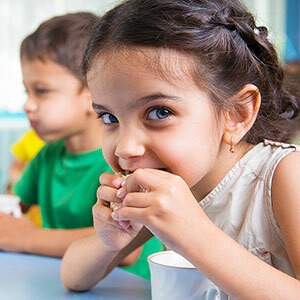 Good nutrition starts at home: it's important not only to offer wholesome foods but to also teach your child why some foods are better for their body (and their teeth) than others. By encouraging a lifestyle of healthy eating both in practice and knowledge, you'll find it easier to set limits on their snack choices away from home. Send snacks with them to school. If you're unsure your child will make the right choices, especially if they're young, than send snacks with them to school. Be sure, though, what you're sending is as appealing as the school choices. Try a little creativity: popcorn with a zing of cinnamon or cheese; decorative snacks; or easy to eat bite-sized fruit or vegetables. The more they like what you're sending, the less likely they'll choose something else. In some ways snacking could be the Achilles' heel in providing your child the right foods for good dental health. By following the tips above, though, you can help raise the chances they'll eat the best snacks for strong teeth and gums.